In honor of our first Christmas as homeowners, we definitely wanted to put some lights up on the front of the house. I thought long and hard about what I wanted it to look like, and hubby agreed that it would be classic and simple to put lit wreaths on the windows. Four windows, four wreaths- piece of cake, right? First of all, we thought we were sooo smart and thrifty. 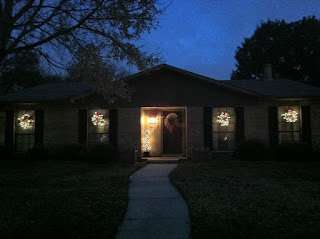 Instead of buying pre-lit wreaths, we bought the wreaths and added lights ourselves to save money. 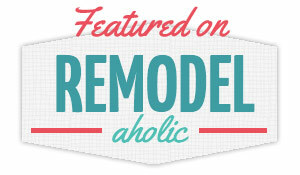 According to the options at Lowe's, we were saving $10 per wreath– an overall savings of $40. We'll take it! Then I receive my lovely Bed, Bath & Beyond mailing, featuring a pack of three pre-lit wreaths, exactly the same size as ours with exactly the same red bow, for only $20. We spent $20 on each wreath! Grrr.... And I had already made the wreaths and everything by the time I got that advertisement, so I couldn't take them back. Frugal FAIL. Once we had the wreaths done, we had no problem hanging them outside our windows (or so we thought). Two days later, one had fallen down and two had been spun by the wind so that they were facing the window instead of out to the street. Sigh. The wreaths hung outside without being lit for about a week while we tried to troubleshoot our next problem: our closest electrical outlets weren't working. Oh, and we didn't have four extension cords that weren't neon orange, so I didn't want neon orange cords hanging from each wreath. Long story short, we spent this Sunday working long and hard on these wreaths. Hubby ending up having to drill a hole in the window frame, string the extension cord through the window to an indoor outlet, fashion a new window lock (MacGyver-style), rip up one of my old black t-shirts as a homemade weather strip for the window, drill into the mortar to get each extension cord to hide itself along the side of the window, strap clear packing tape on each cord so the wreaths wouldn't blow around, and hooking them all up to a dusk to dawn timer so the wreaths would turn on and off automatically and not waste electricity... it goes on and on. Isn't it funny how the projects you think are going to be simple sometimes end up being the biggest pain? One unexpected benefit of the window wreaths is how cozy they look from the inside of the house. And how cute is Nugget #2, sleeping peacefully with her slobbery tennis ball by her side? See our other Christmas lights here. Hope you had an easier time with your Christmas lights than we did! We're going to chalk this year's lights up to inexperience– next year, it's on!